This is exactly what these four almost lifelong friends did, too! All four of them are now retired, 65, or maybe a year or two older, and ready to start that NEW life, even if it didn’t quite hit them until they were all moved in and everything had settled down. The neat thing is they ended up both accidentally and intentionally finding condo’s all in the same building where only one of them lived to start off with and who suggested they live together in her condo building where each could own their own condo, yet still be living together, yet individually as well, all at the same time like they said way back when. Now they were ready to start their NEW lives, and together. What each of these women realize is they are starting a new life with their friends, but it hits them individually, too, as everything they used to know that defines them, and the things they used to do in their lives is now completely different. Gone are the ‘regular’ days where they got up for work to do this or that, and now it’s time to make new days, a new life. One of the women said this is the third stage of life, and they should be full of wisdom. She was challenged by that, not quite agreeing as that put a lot of pressure on them as it was! All of the women start learning what it was that is now defining them, slowly, one by one. One woman adopts a new dog, another realizes she is a lesbian and follows that route, now out in the open, in front of her friends while another friend is so into mysticism that she thinks everything that happens in her life is a sign from her late husband, and I had to laugh at some of the things she came up with, out of the blue as some things were funny, at least I thought. She was so serious about it and there were so many signs she thought her late husband was sending her. I have to say a lot of the things these women realized were things I never gave thought to, such as this period in life being such another defining time in life, a time to remake ourselves as we really are new people again, and this author takes us on these women’s new discoveries about themselves, and some of them even learn things about their families they never knew, thanks to their children. This was an enjoyable book putting a new perspective on our lives, from our retirement years and beyond into the days ahead. I would like to thank the publisher, Baico Publishing, for providing me a copy of this book at no cost to me in exchange that I write a review about this book of my own opinion. I keep waiting for that bolt of lightning which will zap me back once more to the innocence and comfort I used to accept about my belief. But, as hard as I try, I’m not attaining what I once felt. And I keep having such astounding dreams! They are so strange, but so very real. I can see the last one, as though it were some vision before my waking eyes. I’ve even written it down, attempting to make sense of it, to no avail. You have given me such comfort and I am hoping that you will let me prevail upon you one more time and ask that you read what I’ve written about the dream. Does it mean anything? What I saw in my dream was totally vivid. First there was an eye, not my own. It was clear and almond shaped belonging to different faces but the eye was always the same and distinct – not frightening – but evidently searching. Then what became most pronounced was a face with a beard; the beard was first white then red and then turned to flames that would not go out. Was that Michelangelo’s God and Moses merged into one or someone else whom I may have known? Then the face was no more – but now darkness set in. And when the darkness opened as though it were a curtain, which was parted from the middle, what I saw were brilliant colours arcing like a rainbow: red, orange, yellow, green, blue, indigo, and violet. I knew about rainbows because my name Iris comes from the Greek Goddess, the Messenger from Olympus, and Goddess of sea and sky and the rainbow. I remembered that the rainbow is also a sign of a covenant from God to Noah that he would never again destroy the planet. As I thought about these things, the rainbow disappeared and what became visible was the cosmos − the universe with spinning planets which I had heard of others seeing but I never had. Then the canvas of my mind became a map. No, not a map; it was a globe. At least that’s what it felt like because I could clearly see Africa and then another view as the globe slowly turned this time to Australia and then to Italy. Maybe I saw these land masses because they are poles apart and I know them geographically. But the colours were all wrong. The land masses were all red and where the water should have been was all black. And I couldn’t tell if this was the beginning of time or the end – the Alpha and the Omega all rolled into one. I wanted to conjure the black to turn to blue. And I did. And then I conjured the red to turn to green. That took longer first turning yellowish, starting in the Americas but in the end all did turn green though only briefly until it all looked cosmic again with red and deep violet flowing like a great river. You can find this author at these places! 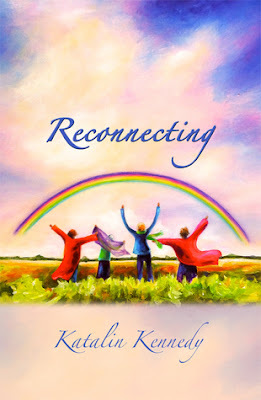 Thank you so much for agreeing to host me and my new novel “Reconnecting” on your web site Laurie Here - Contemporary Fiction and More. Topic: "What is your MUSE for writing? How did your Muse end up becoming your muse?" What huge questions these and how interesting ‒ as they compel me to explore my imagination yet again, from a new perspective. When I was a child, living in Hungary, the stories read to me were the gloomy and dark stuff of European fairy tales, including the many stories written by the Grimm brothers. The impression I still vividly remember was my fear of the horrid witch in the “Hansel and Gretel” story. Others I recall were steeped in superstition with dark and evil creatures that transformed into human form and visa-versa. It wasn’t until I came to Canada at the age of eight, and was given J. M. Barrie’s “Peter Pan” to read, that the world of ‘light’ captured my imagination. The book opened a window to enjoyment and merriment; even the mean old Captain Hook represented nothing more than an adventure to pursue and defeat. I turn to these memories as the backdrop of the plane of thought from where my ‘muse’ originated. Childhood is the unencumbered phase of development which can readily venture into that other dimension where adults fear to tread. Although, tucked in the depth of adult thoughts, we know this probably exists, but we have a need to define such matters logically. So we acknowledge the ‘mythology’ of the Greek and Roman gods. And we weave a faith based acceptance about the ‘miracles’ of the Bible – all the while shying away from the ‘mystic’ as something that isn’t really, real. Or we prefer a pseudo-scientific approach, which suggests that imagination is simply a bi-product of the brain’s function. Period. The concept that right brain thinking represents creativity and the left hemisphere is about analysis and problem solving has been debunked some twenty years ago. Apparently we humans require both in order to live a healthy balance. I do think this concept very much applies to writing: creativity and control go hand in hand. Now back to the question as to what is my ‘muse’ for writing? In my later years, I became intrigued by the ancient “Gnostic” movement which supports the philosophy of an inner “knowing”. I’ve taken this to the next step: there is an intuitive understanding of the mystic within each of us. I ‘know’ that I can consciously summon that other realm and grasp bits of what hides behind shadows. I believe Carl Jung would approve of this way of thinking. In my first novel “The Women Gather” I wove this concept throughout the storyline. The characters themselves demonstrate various aspects of this thinking; mysticism, superstition and logic all mingle together. The storyline unfolds at a symposium of 2066, and is told through articles, letters, journals and videos. A group of visionary women offer solutions to create a harmonious future. 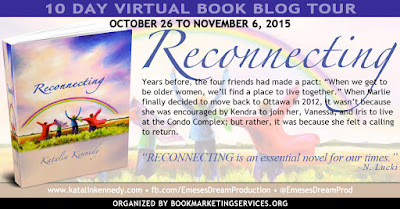 For my current novel, “Reconnecting” I have taken a different approach both in setting and style. Four older women decide to live together in a Condo Complex of 2012 Ottawa. They come from different professions and backgrounds: Marlie the writer, Kendra the psychologist, Vanessa the artist and Iris the health care promoter. They agree to meet at weekly dinners where they discuss their beliefs, their fears, their hopes and their secrets. Over arching it all are mystical messages that emanate in dreams and waking hours. From where did I arrive such storylines? Well from my ‘muse’ of course! For me the ‘muse’ doesn’t fall out of thin air, nor is it some angelic entity. It is something quite inexplicable though perhaps ethereal, existing within us. How and what I draw from it, are influenced by my background, my learnings as well as my own personal beliefs, feelings, experiences and observations. It is from all these that I am able to weave my particular world view. I have been an avid reader and researcher all my life. I know of the works of Shakespeare such as “Titus Adronicus” and epics such as Leo Tolstoy’s “War and Peace” each of which attempt to explore the human condition, to find a balance between good and evil. We now have the tremendous knowledge base of the world wide web at our fingertips. We can readily explore what all has been written and reviewed by writers of any culture throughout the ages. I do think one consistency among writers is that we have a ‘need’ to write. Now is that the universal consciousness to which Jung refers, and which calls on us to create? In as much as I have always written for myself, I was hesitant to produce an entire novel for the public because ‒ hasn’t it all been said? What finally gave me the encouragement to begin was when a friend proclaimed that I haven’t said it yet. First and foremost, I am a methodical writer. I need to research my topic, then develop a solid outline, and begin to weave the storyline as well as shape the characters and their raisons d’être. As I am very much a supporter of what I call ‘the mystic’, I can’t help but intertwine that into my novels. Thus, from the outset, I acknowledged the relevance of this other dimension in both my novels and called upon it to make an appearance. But I made every effort to consciously control how that fit the storyline. It was not until I was well into the writing that I ‘let go’‒ now and again. This is the experience that I call the ‘magic’ and ‘reward’ of writing. For a period of un-clocked time, something takes over: the characters begin to assume a life of their own; the storyline begins to meander in directions one hadn’t considered. When this happens, one is drawn into a rapturous plane of ‘elsewhere’. I have heard this from artists, musicians and other writers. Somehow, we part that hidden veil and like Alice, walk through the looking glass or through the wardrobe of Narnia. For a moment ‒ or hours ‒ we drink in the experience of that other world we created. As the writer, however, we need to remember that it is we, who are the original ‘weavers’ of the magic; and therefore it is we, who must take control ultimately. Creativity must be tempered by boundaries, when writing a novel. I hope my meanderings have provided some food for thought to your questions. 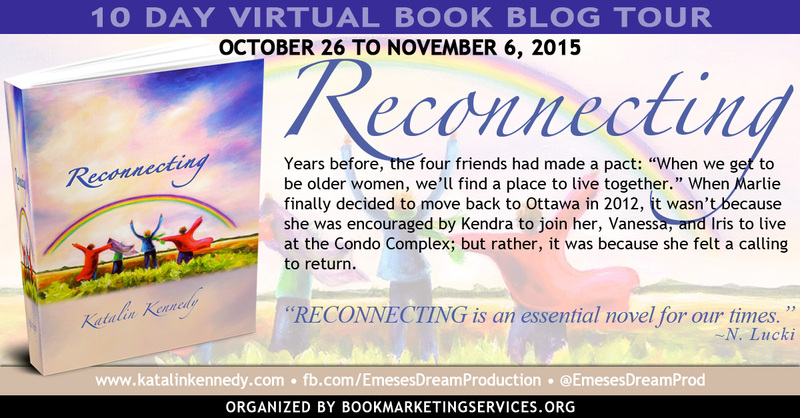 Thank you again for hosting my new novel “Reconnecting”. I just want to sneak in here and tell Katalin "Thank YOU SO MUCH, Katalin!" That was NOT an easy question! What a wonderful and beautiful answer you wrote for us! Thank you, again! The Women Gather and Reconnecting are available in print only, no ebook at the following stores in both the US and Canada (sorry, no INTL sales UNLESS you can purchase your book from the US OR CANADA as an INTL sale. Please check with the sellers! 3rd place: Autographed copy of the print book! 2nd place: Autographed copy of the print book! 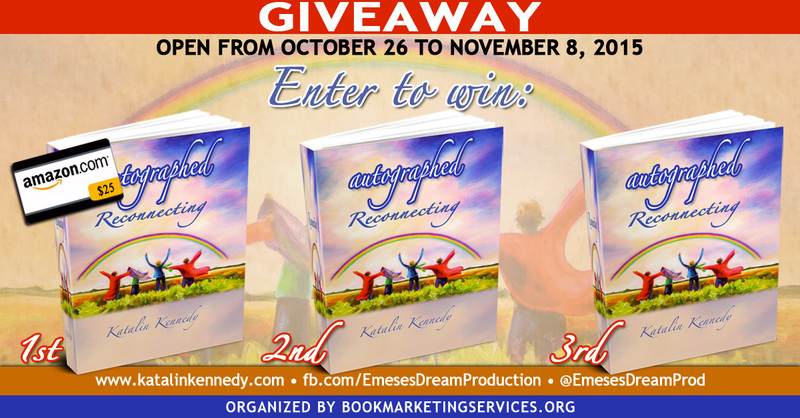 1st place: Autographed copy of the print book PLUS '1' $25 Amazon Gift Card!!! Thank YOU for stopping by my blog today! Your book taught me when anyone reaches that retirement age, they will have to reinvent themselves completely. Gone are the days as we once knew them. Kind of sad, in a way, especially if someone is lucky enough to have worked at the same place for most of their lives! Your book did point out this is not the end of our lives but the beginning, and we have another NEW life to choose to live! That is exciting for the people who think life is over after retirement, and actually, this book is NEEDED for them!! Thanks! You've probably save a lot of people's lives with this book as I know too many who have just given up. I have a weapon in my arsenal now, and if anyone I know gets down about this, they get a copy of this book! On behalf of Katalin Kennedy and Book Marketing Services, I would like to thank you for hosting and interviewing Katalin today on Laurie Here – Contemporary Fiction and MORE. If anyone has any questions and/or comments they would like to share Katalin will be by later in the day to respond. Please join Katalin Monday, November 2nd, 2015 when she will be interviewed by the Deal Sharing Aunt http://www.dealsharingaunt.blogspot.ca/. Thanks for stopping by, Della! Thanks for letting us know where her tour schedule is, too! I did not see it on Facebook, but probably by the time I was ready to post that, my eyes were blurry from posting all I had done already and I missed it! Now we have it - just go to her Facebook page! I have that link up above under, "About Katalin Kennedy" and those links 'are' LIVE! 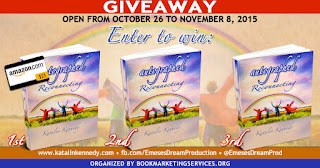 The Giveaway - that is up above and LARGE! No one would miss it, however, it does NOT STATE a 2nd OR a 3rd prize, so thank you for pointing that out! My question to you is this: Is that Giveaway form up above a SEPARATE Giveaway from the Giveaway you are talking about in your comment? I'll email and ask you so people know. There is only the one form for the giveaway. The winners will be picked randomly and the first name drawn will win the first prize and the second and third names drawn will win the second and third prizes. Thanks again for hosting Katalin today. That's the Rafflecopter form up above! Just fill that out and you are ENTERED!!! Thanks SO MUCH, Della! You are an AMAZING person!!! Lovely to celebrate books with! !